To this day The Voynich Manuscript remains both a medieval masterpiece and historical anomaly that has baffled and bedevil all those who have been drawn to its mystery. Spoken of in esoteric literature with all the reverence of a newly discovered alchemical formula and all the vehemence associated with the Shroud of Turin and its validity. There are those who claim it is a fake. The manuscript, written entirely in long hand in a script that has never been deciphered or identified in any other medieval text remains the only one in existence and as such has lead many to question its credibility. Its Author has never been identified. The 4oo year old tome believed to have been made between 1404 and 1438, in itself is over 270 pages long and is embellished with more than 150 coloured illustrations of Astronomical diagrams, Botanical drawings and what appear to be Alchemical pictographs. It is a small book approximately 10×7 and 2 1/2 inches thick, of extraordinary water-colour drawings of plants and herbs hitherto unseen in catalogs of that period. With the inclusion of suffixes and prefixes and instances of identifiable grammar, the most sophisticated computer analysis has determined that the Voynich script appears as technically consistent as real language. The manuscript was written in a code that has continued to baffle cryptographers since it first surfaced at the Court of Rudolf II of Bohemia in 1586. Emperor Rudolf , excesses aside is renowned for his collection of natural and cultural artifacts that he kept in a vast private museum, as well as acquiring the most detailed manuscript catalog of its kind. Regarding its authenticity there is no question. Carbon dating tests conducted by Researchers at the University of Arizona in 2009. In addition, the McCrone Research Institute in Chicago found that much of the ink was added not long after-wards, confirming its medieval origins. It is the fact that it was written in no known alphabet of which the manuscript remains the only known example which makes the undecipherable book an enigma. The inability of Astrologers, Alchemists and cryptographers that populated medieval Europe at the time and WWII code breakers, both American & British to crack the elusive code, that has lead to its incredulity by mainstream academia. The illustrated book is named after the Polish-American Book dealer Wilfred M. Voynich who acquired it in 1912. The Manuscript was delivered to Rudolf II by an unidentified courier who sold the book for 300 ducats, the equivalent of $14000au today. A note glued to the inside of the book states it once belonged to the private library of P. Petrus Beckx S.J. After the Court collapsed in 1619 it passed on to the Court’s Botanist. Upon his death it passed on to an anonymous collector and there it remained for 20 years. A faded signature on the first page quotes the name Jacobus de Tepenec, who turned out to be a courtier of Rudolf II. The MS changed hands several times during this period to various men of renown including Marci, and his benefactor Georgius Barschius, and the famous polymath Kircher who studied artificial languages. Kircher later joined the Jesuits and is believed to have donated the MS along with several others in his collection to the order. There it remained on a shelf in a library in the south of Rome until 1912 when it came into the possession of Wilfred Voynich. Voynich died in 1931, and Ethel Voynich, his widow, inherited the MS, handing it down to Miss Anne Nill, who was formerly Voynich’s secretary. The Voynich Manuscript is now housed in the Beinecke Rare Book and Manuscript Library at Yale University. There have been many attempts throughout the Book’s history by laymen and professionals alike to unravel its code. 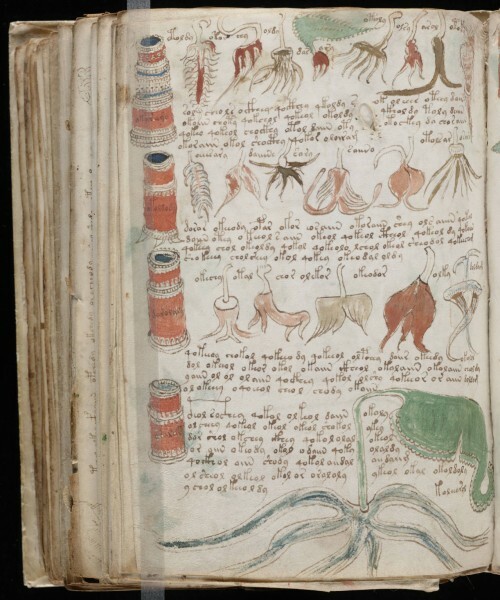 Voynich himself embarked on a campaign to establish that the Voynich MS was a major document in the history of science. He was convinced that it was written by Roger Bacon. Supported by two scientists who thought that they could read the MS, Voynich presented it in 1921 at the College of Physicians of Philadelphia. William Newbury in the 1920’s claimed he had completely deciphered the text, but it was found upon scrutiny that his conclusions though sincere, were completely misguided and driven by delusion. The most comprehensive and scholarly of these studies however is by Mary d’Imperio. 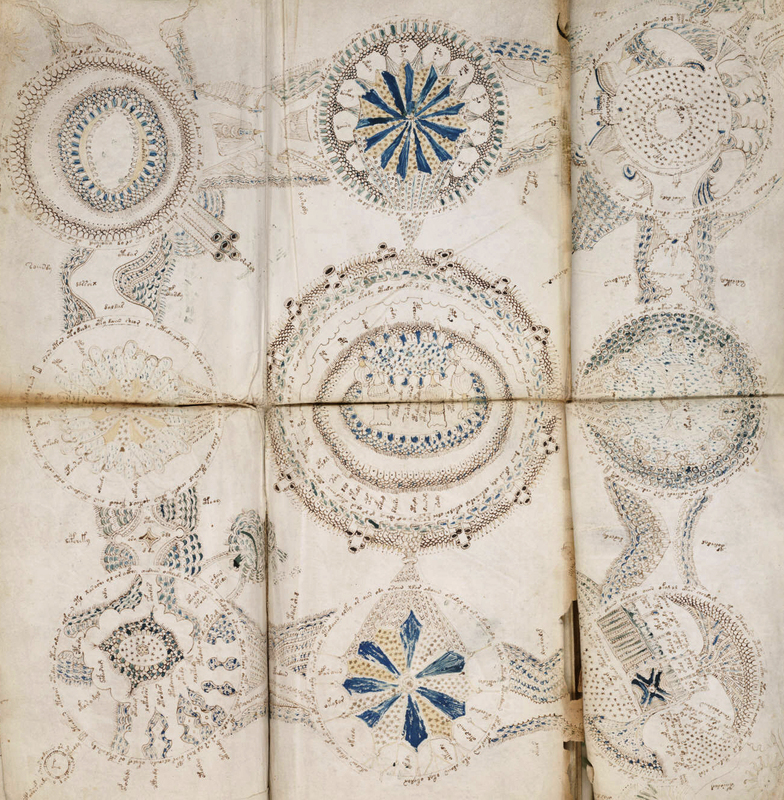 Her book titled ‘The Voynich Manuscript: An Elegant Enigma (Cryptographic Series, no. 27)’ is part of The National Security Agency’s catalog and is available through the Central Security Office Fort Meade Maryland. In investigating the origins of the manuscript one has to understand the era in which it was borne and the people populating it. Most notably the English Mathematician Dr. John Dee: The Queen’s Conjurer. Born in 1527. He was also an Astrologer, Astronomer, Hermetic Philosopher, Navigator, Cartographer and Spy. Dee often signed his intelligence documents with the moniker 007 and is the originator of the famous Ian Fleming character. Dee’s high status as a scholar (in his life time he amassed the largest library in Europe) allowed him enter Elizabethan politics and was made confidante to Queen Elizabeth I. A Master linguist adept in Greek, Latin and Hebrew. He was the quintessential magician, the model For Shakespeare’s Prospero and Goethe’s Faust. Dee’s accomplice was a dangerous and disruptive man called Edward Kelly. A scoundrel by all accounts he was the very flip-side to Dee’s personality. He had looted a catholic monastery in Wales before visiting Dee aquiring a book entitled the Gospel of St Dunstable. Enter the Steganographia of Johannes Trithemius (1462-1516), a 15C manuscript written in a coded language that Dee believed to be a repository of hidden arcane knowledge and the first work on cryptography. Dee copied the Steganographia while in Paris. This story is verified in the notes of Dee’s son Arthur who writes, during this period his father concentrated his time deciphering a book covered in hieroglyphics. In August 1584 Dee and Kelly entered Prague for an audience with Rudolf II, Bohemia’s ruler. Rudolf’s penchant for the bizarre entertained the thought of a trusted advisor of a political rival, namely the protestant Queen Elizabeth I seeking audience with the ruler of the Holy Roman Empire. He recieved his visitors with astonishment and intrigue. It is possible that Dee and Kelly contrived the manuscript which they sold to the court of Rudolf II in Bohemia (now Prague). Cursory analysis of Dee’s Diaries in relation to the hand written codes do point to Dee as having written the page numbers on the top corners of the manuscript however, scholars are quick to point out this may only mean Dee collated the pages of the book and not necessarily written it himself.